Published in Centretown News, Front Page, November 25/11. See the two letters full size at end of post. A Toronto artist, who says she has been blacklisted by the federal government, is displaying posters along Bank Street aimed at the government’s climate change policies. Franke James says the Canadian government interfered with her European art tour because she criticizes their environmental policies. Nektarina, a Croatian non-governmental organization specializing in environmental education, planned to exhibit “What Can One Person Do?” in 20 European cities later this year. James says the tour fell apart this summer after government officials discouraged the show’s producer from participating. An official statement on Nektarina’s web site alleges the Canadian government tried to interfere with the tour. “When Nektarina decided to present Franke’s artwork . . . we felt confident of the support of Canada – Franke’s homeland. Regrettably, the Canadian Government has since declined support for the project, verbally explaining that ‘She (Franke James) speaks against the Canadian Government,’ ” says the statement. James says the climate change office at the foreign affairs department also interfered with Nektarina’s request for funding. But James has obtained emails through access to information legislation which reveal that $5,000 in funding had been internally allocated for the tour. On April 29, Sylvie Gauvin, a strategist for the Foreign Affairs Department, sent an email to Vlatka Ljubenko, a public affairs officer at the Canadian Embassy in Croatia, which confirms the allocation. “(The Foreign Affairs Department of Strategy and Services) is able to give $5,000 on our Advocacy Funds for (James’ tour),” she wrote. 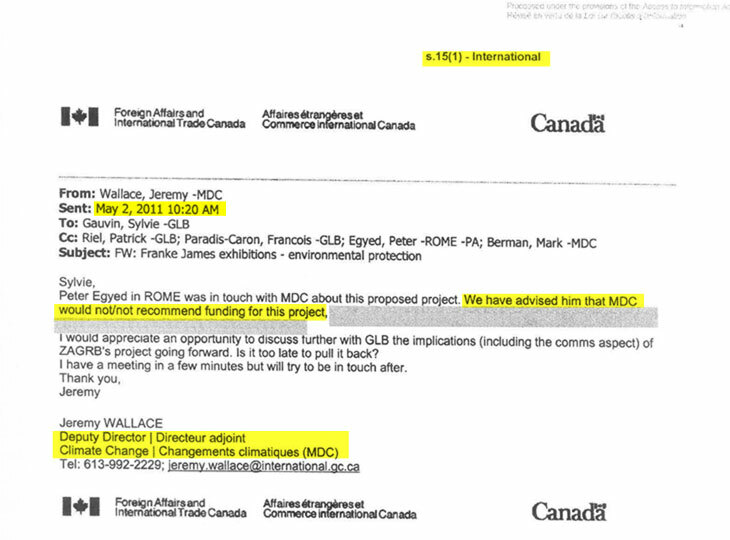 On May 2, Jeremy Wallace, the deputy director of the Climate Change Division at foreign affairs, sent an email to Gauvin asking for further discussions about the project. James says that the loss of $5,000 did not seriously affect the show, which had a budget of hundreds of thousands of dollars, but it proved something that government officials were denying in the media. “The show was killed because they were bad-mouthing me to the NGO,” says James. In mid-July, the show’s main corporate sponsor also withdrew its financial support. James raised $4,226 online to bring five posters based on art from that tour to Ottawa. She also designed a new piece calling on Prime Minister Stephen Harper to stop “blacklisting” environmental voices. “I thought the most fun thing to do was actually mount this crowd-funded art show on the streets of Ottawa as close to the Parliament Buildings as I could get,” says James. James says the current government has a tendency to silence dissenting voices. Graham Saul, executive director of the Climate Action Network, an environmental advocacy group based in Ottawa, says the Conservative government is “vindictive and mean spirited” when facing public debate about its policies. “Previous governments have always had thin skins but also acknowledged and understood the value of meaningful public debate,” he says. James previous visual essay entitled Dear Prime Minister, criticizes the government’s development of the Alberta oil sands. “What underlies this is that right now, in the European Union, they are deciding whether or not to slap a dirty oil label on tar sands oil,” says James. James’ posters will be in Ottawa until Nov. 27. This article was originally published in the Centretown News. Note: Part of the second sentence in this email was redacted by DFAIT according to Section 15(1) of the Access to Information Act, because its release could be “injurious” to matters of international affairs and defence. On May 5, Jeremy Wallace wrote, “I take this opportunity to share, for your information/background only, the following considerations, which are not/not intended as material response to the requester”. 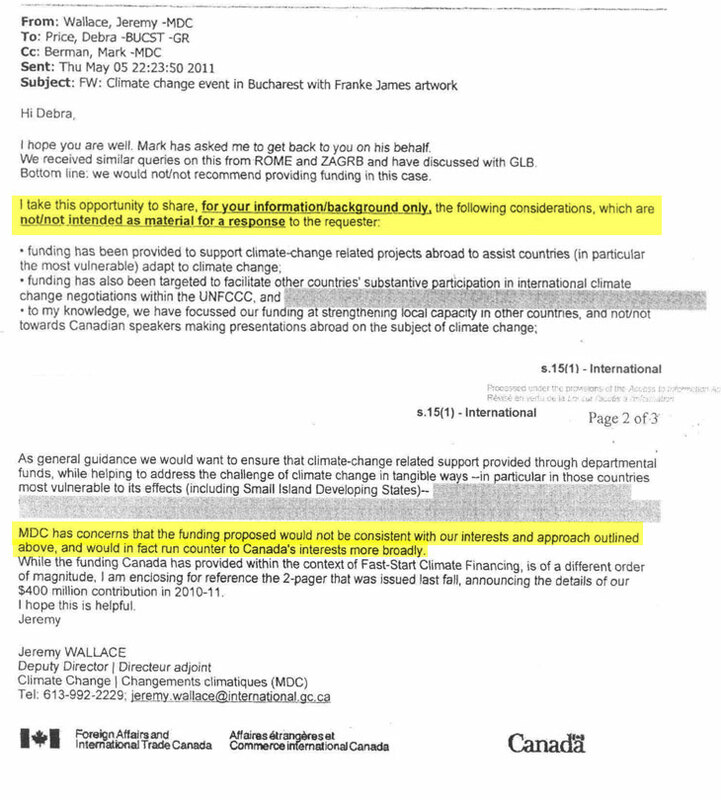 Mr Wallace provided several reasons for this withdrawal of support (some of which are redacted for reasons of “International Affairs and Defence”) and sums it up with the statement the Climate Change office, “MDC has concerns that the funding proposed would not be consistent with our interests and approach outlined above, and would in fact run counter to Canada’s interests more broadly”. 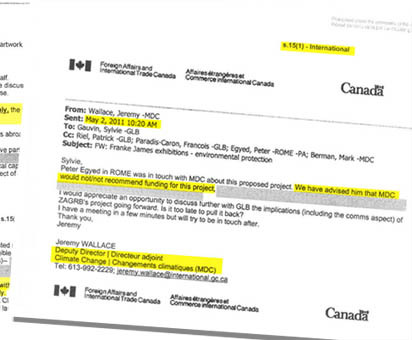 Note: Sections of this email were redacted by DFAIT according to Section 15(1) of the Access to Information Act, because its release could be “injurious” to matters of international affairs and defence.